It's been away since I blog since last January. Anyway many of us & Me included are heavy user of smartphone for work or personal purpose . Unfortunately that left our phone with rather short battery life . Powerbank or Mobile charger is a must in this day so our phone can work and extend its operating hour bit longer until we reached our home to fully recharged it again . 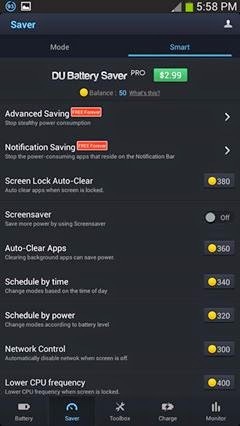 Introducing "DU Battery Saver, the world’s leading battery saver and Android power doctor & manager, is a FREE battery saving app that makes your battery last longer! 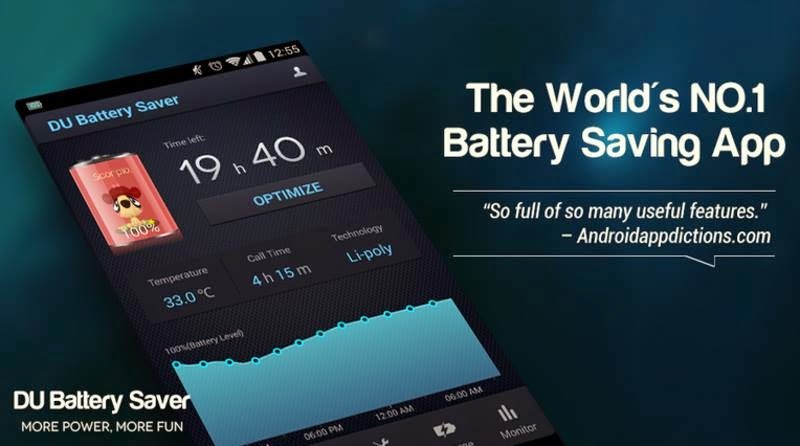 Get up to 50% more battery life for Android phones or tablets! 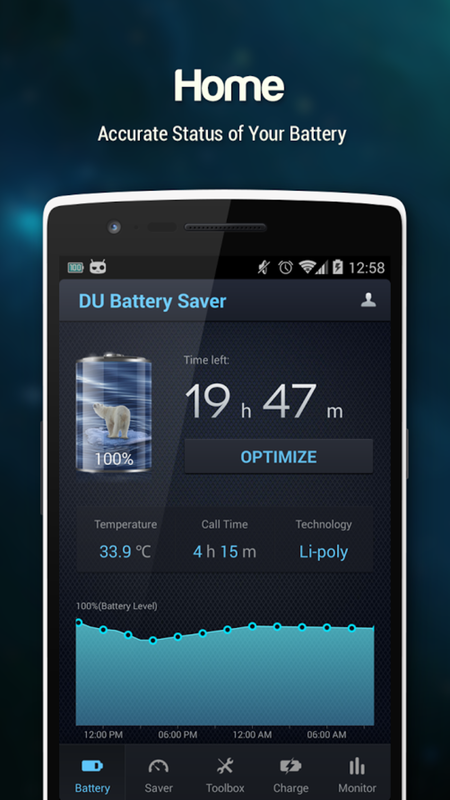 With DU Battery Saver’s smart pre-set battery power management modes, one-touch controls and healthy charge stage features, solve battery problems and extend your battery life. 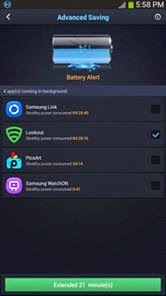 "Presented by DU Apps Studio, DU Battery Saver is the simplest and easiest way to keep your Android phone working well when you need it, and protect against poor charging, battery hogging apps, and overlooked device settings that shorten your battery life. After downloading the app, from the store, the 1st thing I notice the little "DU battery Saver" icon on the top that remaining power accurately, temperature , the mode which you selected from "Saver" Task-bar. 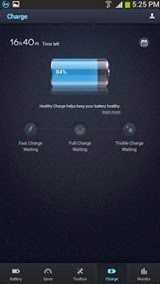 After opening the app, you will notice a task-bar containing (Battery,Saver,Toolbox, Charger & Monitor) . 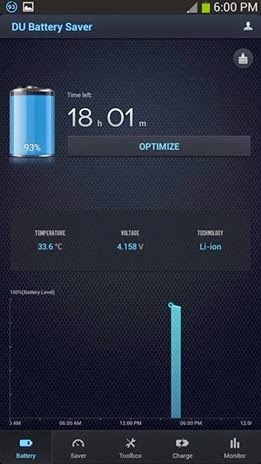 Let 1st focus on Battery section , you will see big giant picture stating remaining operating hour, temperature, voltage , power consumption thru out the day plus "Optimize" button . If you click on it, the app will start to scan and remove hidden app from your phone so it will work smoother plus some power-saving suggestion at the end of result . There's even another another "Optimize" app alongside the "DU Battery Saver" icon on your home screen widget if you want faster response to kill off unwanted app . If you click the small duster icon on top right, It actually a suggestion link for DU speed booster (another useful app ) that focus on cleaning up space in your phone . The "Saver" contain Mode section where you can select "Prolong" mode allowing to you to use the phone minus internet connection with minimum power for screen brightness & timeout while "General" mode allow you access to internet connection with decent power for screen brightness & timeout & Finally "Sleep" mode is almost similar to "Prolong" mode with both Clock and Alarm are set during your sleeping hour. The other section of "Saver" are Smart section where you select more (Screensaver, Advanced & Notification saving are free) & unlock new option trading it for gold point which can be earn downloading other app or games in "Toolbox" section . You can purchase the Pro version for $2.99 (US Dollar) to avoid the hassle . The "Charge" section s basically simplified but interesting section where you can see "Fast charge when low on power, Full charge when almost charged and Trickle charging when your phone is almost nearing full" . This keep your phone battery healthier for longer life span. It even got charging record detailing number of times you charge your phone in that month. The App recommended a healthy charge when your phone battery is less than 20% . 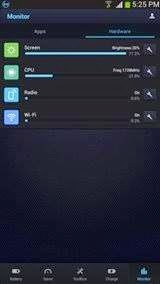 The last part "Monitor" give you good glimpse on number of app running on the background plus total amount of resource it used to keep it running. So clicking force stop or un-selecting "Show Notification" will help your phone in long run .